Größe dieser Vorschau: 530 × 437 Pixel. Weitere Auflösung: 291 × 240 Pixel. 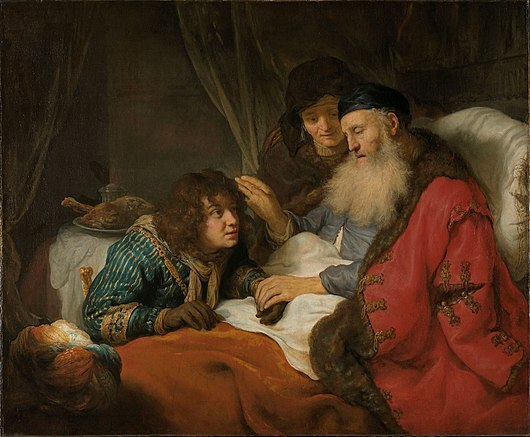 Isaac blessing Jacob. An elderly Isaac sits in his bed and blesses Jacob. To the right of the bed Rebecca is standing. The Bible, Mythology and Ancient History. Rembrandt and the Rembrandt School, 13. September 2003 – 14. Dezember 2003 , National Museum of Western Art, Präfektur Tokio. Rembrandt and the Golden Age of Dutch Art. Masterpieces from the Rijksmuseum, Dayton Art Institute, Dayton, Ohio, 24. September 2006 – 7. Januar 2007 , Phoenix Art Museum, Phoinix, Arizona, 27. Januar 2007 – 6. Mai 2007 , Portland Art Museum, Category:Portland, Oregon, 26. Mai 2007 – 16. September 2007 , p. 91. RKDimages, Art-work number 2797, als Isaak zegent Jakob, 1638, inv. A 110. Royal Institute for Cultural Heritage Photolibrary, object number 40004872, als Isaak zegent Jakob, 1638.
aktuell 20:46, 12. Jan. 2019 5.722 × 4.720 (3,95 MB) Mr.Nostalgic Higher resolution.